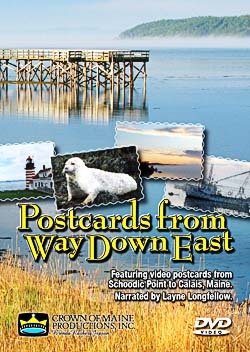 This DVD features over thirty scenes including a variety of activities – whale watching off Eastport, an artist at work in Addison, lobstering with Ronnie Look, Machias Blueberry Festival, a puffin trip out of Cutler, pottery making in Columbia Falls, wine tasting in Gouldsboro, a boat tour on the Pleasant River, and hiking in Petit Manan National Wildlife Refuge, to name a few. 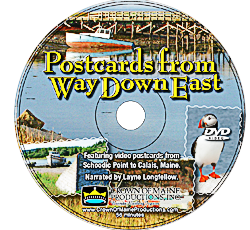 Scenery from Schoodic Point to Princeton punctuates these activities. “Postcards From Way Down East” may be watched as a fascinating hour-long show, or the viewer may select out chapters of interest to plan an outing – from an art tour to a wilderness hike.